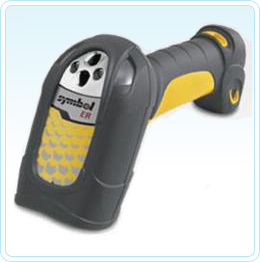 The LS3408-ER hand-held corded scanner captures 1D bar codes in the harshest of conditions — even when labels are at varying distances. Featuring the widest working range available, it reads labels as far away as 13 metres (45 feet) and as close as 10 cm. This scanner is ideal for warehouse and manufacturing facilities, with an ergonomic design that makes scanning comfortable during long shifts. Multiple on-board interfaces to ensure compatibility with different hosts. The most popular is USB followed by RS-232 serial connections. Delivers clearly visible line for more accurate scanning. Offers fast, accurate bar code reading on menus and pick lists. Ensures flexible connectivity, allowing for host "future proofing." Eliminates costly modifications to the host software. Facilitates updates and customization of product in the field. Makes replacement or upgrade easy. Facilitates update of your hardware investment. Scanner warranty 3 years (36 months) from date of shipment. See full warranty for details. 4 Specifications are subject to change without notice. This retractable cable is attached to a pulley system to keep your barcode scanner out of the way, but within easy reach.